Cloud archiving involves moving large volumes of your mail to a cloud account. It is therefore wise and recommended to make a backup of your Outlook mail store (Identity) before conducting these operations. Steps 1 to 3 of this article can guide you through a backup. 2) Select the Cloud Account. The max size in megabytes and helps prevent uploading of mail that is too large for the cloud providers policy. GMail doesn’t allow mail larger than 25MB. Any mail over this size will be left behind in it’s Local Archive Folder under ‘On My Computer’ to allow for attachments to be backed up manually. 3) The Local Archive Folder can’t be set from the Cloud tab (though it is shown there read only). This is set under the Mail tab. It can be set to any folder under ‘On My Computer’. 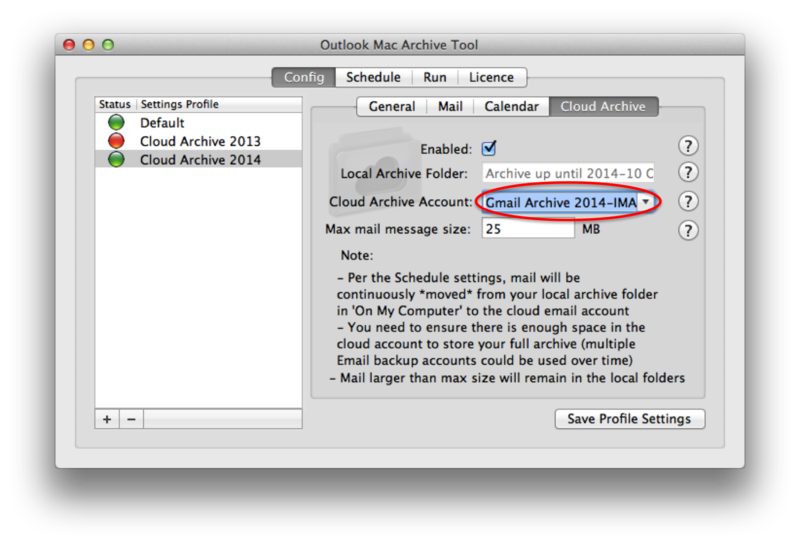 Local Mail Archiving does not have to be enabled for you to set this folder. This means you can point it to any folders you manually created under On My Computer which is useful if you want to Cloud Archive a long history of prior stored mail. Hi Michael, I understand it ‘moves’ the ‘On My Computer’ archive to a cloud presence – which is perfect for what I want but are you able to tell me if it will retain/replicate/create the folder structure that archive may have. I’m intending to move the archive into MS Exchange Online. Before I push the button I just wanted to ask – and I apologise if you have answered this query already. Hi David, yes that’s the principle of how it works! It’s always wise to backup your identity before bulk moves. 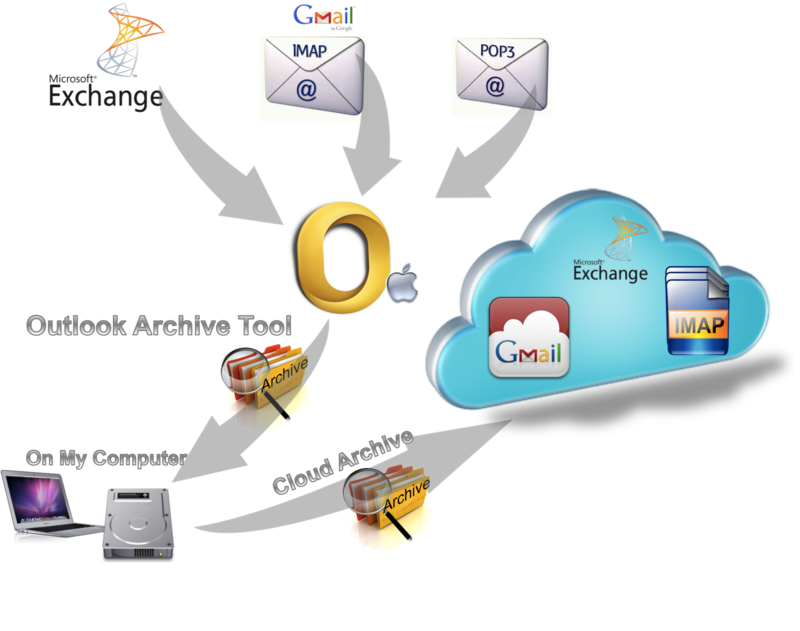 The software effectively moves mail from the On My Computer folder in to the offline cache of your chosen ‘cloud mail account’. So the account type has to allow push of mail and allow it to finish syncing! Try it perhaps with a small test folder. Lastly find out what the maximum mail size that the account supports (Gmail is 25MB). Any email above that limit will be left behind in the local folder structure for you to save out and deal with manually. we have big amounts of mail. our provider allows 10GB mail size per user and with this software we are now in the position to solve this problem. However it is my understanding that the backuped mails are now saved “on my computer” and I have to make sure that the local harddrive is regularly being backuped. My Question: If I would choose the cloud account, then I would be again limited to the maximal size of the provider (10GB in my case). I need about 10 to 20 GB per user per year. How can I solve tis issue? Hi Andreas, yes you are correct it will archive locally to your local database (Identity) which you can backup manually or with time capsule etc. If you choose to use our cloud archiving then signing up for a free Gmail would give you 15GB space. You can then switch to a different gmail account each year (myprivatearchive.2014@gmail.com, myprivatearchive.2015@gmail.com etc). This is one solution to the problem. You could also use the Amazon WorkMail solution which gives you 50GB space per account for 4 USD per month. It supports Outlook and any mobile ActiveSync client. Does it move the mail to the cloud directly, or to a folder locally that is then replicated to the cloud (gmail)? I moved messages manually from my “on my computer” folder to a folder I created under my gmail account and they never replicated up to gmail. It moves the mail to a folder under your Outlook connected Gmail account which handles the IMAP push up to the cloud. You have to be on a network that allows IMAP ports and you can look at our user guide on how to configure the Gmail account. We have many customers uploading to gmail in this way. Our tool just automates the process. We also ran a test our side manually dragging a file and it worked so not sure why not in your case. I would like the archive on gmail, or wherever in the cloud, to be encrypted. Would utilizing Outlook’s security measures to encrypt sent email accomplish this? 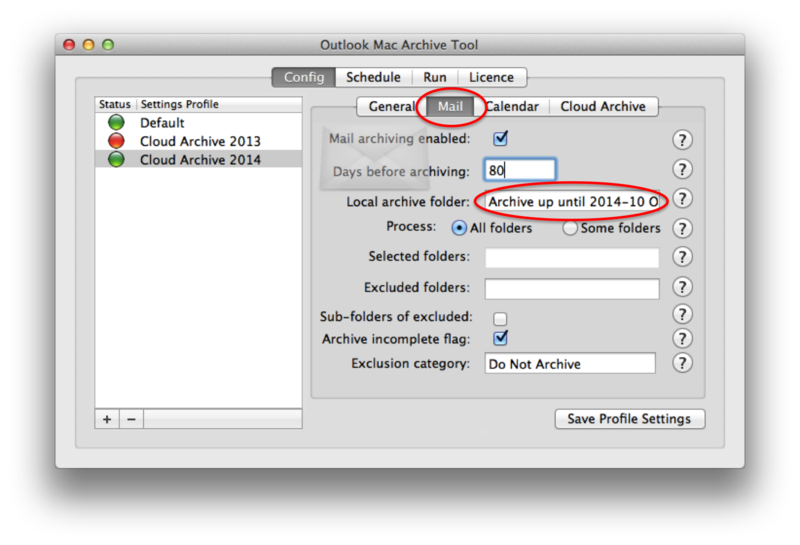 (Do you use the Outlook client to actually resend inbox mail back out to the archive?) Or, will gmail’s pending end-to-end encryption initiative work? Any suggestions on how to offload 15GB of mail archive to the cloud, encrypted? If connecting to the archive via a browser, are there good extensions/plug-ins to facilitate searches? Hi Mark, great questions. Our tool doesn’t re-send your email it synchronises it through IMAP protocol which Outlook supports. Just as when you move mail in to a folder from another account it uploads it to keep the server in sync. IMAP connectivity is encrypted on the wire with Gmail (SSL port 993) so there is some protection there. In terms of encrypting every email in the account (i.e not just the ones you send encrypted on the fly through a Chrome plug-in or something), then you are probably looking for a product like CipherCloud. I’ve not used their platform nor tested our tool with it but it looks like good potential. In theory you would enable CipherCloud in Outlook connected to an empty archive Gmail account and then use our Cloud Archive feature to synchronise in to the fully encrypted account. Our tool will handle any size of mail account as it performs move operations so the process can be interrupted and it will carry on processing from where it left off. The upload to the cloud actually happens asynchronously so it can finish the move locally in your Outlook and then upload over many days. The mail is searchable within Outlook and Gmail has an excellent search facility through it’s web interface. With a mailbox of your size it’s always advisable to backup your Outlook database before performing such operations out of good practice. We will likely not support iCloud as (for now) this is more focused on file backup as far as I am aware. We are in the game of keeping your mail fully searchable in it’s folder structure in the cloud. Hi Mark, yes it moves the contents of your archive folder on ‘On My Computer’ to the cloud (or any folder you point it too, even folders you manually created in the past). The reason it moves it is that you have the IMAP account setup in Outlook mapped to your GMail account which effectively makes all mail searchable from Outlook (even when you are offline). Outlook caches the mail for you to view and search just as if it was under ‘On My Computer’. So it’s not necessary to have it also duplicated on ‘On My Computer’. 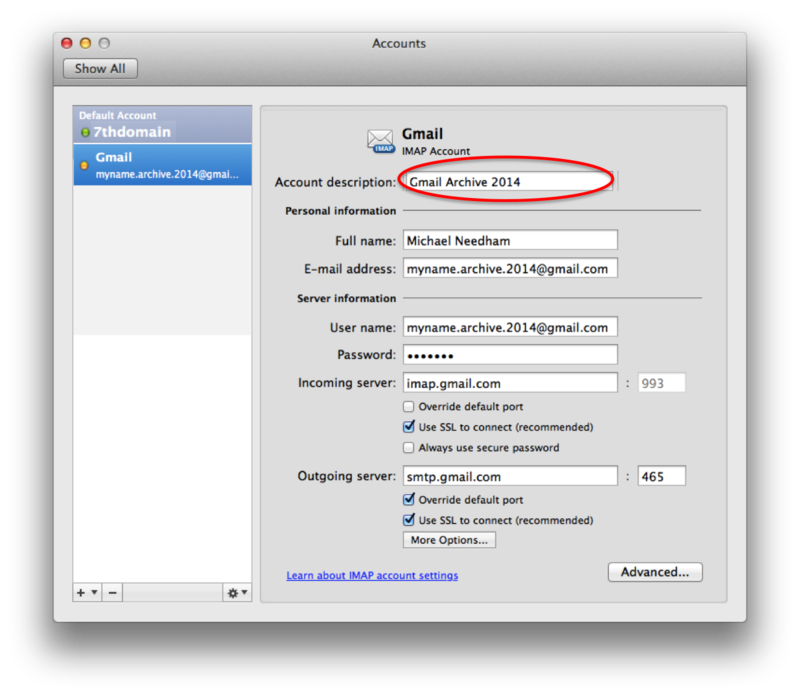 When you feel you don’t need it searchable right in Outlook (very old archives for example) you can always remove from Outlook the IMAP GMail account, freeing up space on your Mac. Of course its still available available through the Gmail web interface should you need something or you can remount it again later. So if I understand this correctly it “moves” not “copies” the archive from the local machine to the cloud backup? Thus, if I want to keep a searchable archive on my local Outlook install best practices would be to run the cloud archive at the end of the year? Is there a way to make it a copy instead of a move so it appears in my cloud archive as well as local?